Ever since I was a kid, one of the only ways we had oatmeal was if it was baked. It is the most delicious way to eat oatmeal. I have given the recipe to some of my friends and they eat it more often than I do now. The longest part of the recipe is the cooking. It takes about 10 minutes to prepare and 40-45 minutes to bake. It originally was a non-vegan recipe. When I was vegan, I found a way to make it vegan without changing the recipes taste or texture. In parenthesis, are the alternative ingredients to make the recipe vegan. Preheat oven to 350°. 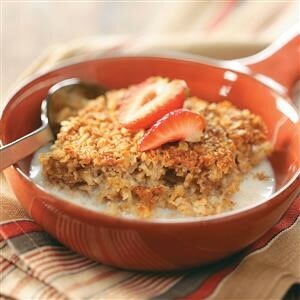 In a large bowl, combine oats, brown sugar, baking powder, salt, cinnamon and nuts. In another bowl, whisk eggs, milk and butter. Stir into oat mixture until blended. For leftovers, store in fridge and reheat in microwave or oven, then add extra milk. If you want to make them more convenient for mornings, make them in a muffin tin. The cooking time would be a little less. I hope that you love this healthy and tasty recipe! Please, post your comments if you try the recipe.